Before Captain Tony Collings came up with the idea for Horse of the Year Show, there was no special event to mark the end of the equestrian season. He believed that there was a need for a celebration of the year, a champion of champions show. Indeed there was, for his idea was picked up by the then Chairmen of the British Show Jumping Association and British Horse Society Colonel Mike Ansell and Colonel VDS Williams. Timing dictated that the show would be held in the autumn, and so an inside venue would have to be found. So a trip to the famous indoor show in Paris “Le Jumping” was planned. Ansell and Williams were amazed at what they saw; the audience reaction and participation was unlike anything they had seen and they set about transposing the show for a British audience. As Ansell was chairman of the British Show Jumping Association, it was agreed that the BSJA would stage the show in conjunction with the Greyhound Racing Association, owners of the arena in Harringay, which had been selected as the venue for the show. 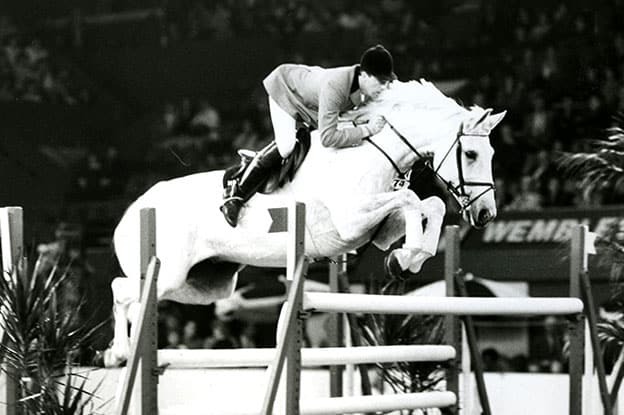 Tony Collings, the man behind the original concept, was brought back to plan the show and whilst his aim was to run a champion of champions showing event, a compromise was made with Ansell who believed that it was show jumping that would bring in and excite the crowds. It therefore became a BSJA jumping show; with a balanced mix of show classes open to qualified horses and ponies that had won prizes at major shows during the season. Thus in each section there would be a “Horse of the Year”, and in 1949 Horse of the Year Show was born. The entries were good – there were 400 in all, and the competition was spectacular. With no lack of talent, word of mouth ensured that, by the final night, it was virtually a sell out and certainly a triumph. The show moved to Wembley Arena in 1959 and for the next three decades it went from strength to strength before coming under competition from the growing array of other sporting events. Since the 1997 Horse of the Year Show, the event has been organised by Grandstand Media Ltd who have revitalised the presentation and content, including a special celebration in 1998 to commemorate the fiftieth show. In 2002 HOYS moved from Wembley Arena, its home for over 40 years, to the NEC Arena, Birmingham. Logistically this was very complicated as the show takes up over 50 acres of the NEC complex, but with record attendance figures and outstanding competition, it was described by Horse & Hound as a ‘Triumph’ and was heralded a resounding success with sell out performances throughout the show. Since the move to the NEC, HOYS has developed and expanded experiencing record numbers visiting the Show every year. Having celebrated its 65th anniversary in 2013, today’s Show welcomes 1,600 horses and ponies, 1,500 competitors and 65,000 spectators. Each year, Sunday’s Gala Evening Performance concludes with the emotive Ode to the Horse.